Unless you’ve been living in a hole (or in denial) the last few weeks, you’ve probably noticed that it’s Christmas Day on Sunday. So as one last push to get you into the festive spirit, we thought we’d share with you some interesting Christmas facts you can amaze your family and friends with this weekend. • Drinking mulled wine at Christmas originates from Germany during the Medieval period. However, records show that a spiced wine was drunk all the back in 5000BC by ancient Greeks who believed it had healing properties. • Coca Cola did not invent the red Santa Claus; up until the 1930s he had already been depicted as red, green, short, tall, fat, slim. However, Coca Cola has literally shaped the image of the jolly figure we all know today. • One – perhaps rather bored – American scientist has calculated that Santa Claus would have to visit 822 homes a second at 650 miles per hour to deliver all his presents on Christmas Eve. That’s why he uses magic, der! • The ‘X’ in Xmas is not irreligious; it is actually the abbreviated Greek symbol for ‘Christ’. • Every Christmas since 1947, Norway has provided Trafalgar Square’s Christmas tree to thank us for our support during the Second World War. • The world’s largest ever snowman was built in Maine, USA in 1999 and stood at a whopping 113ft tall! 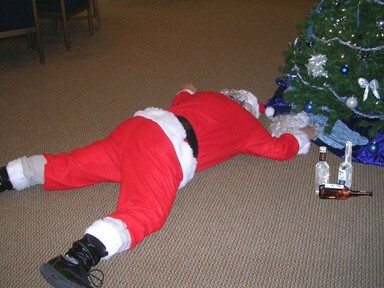 So from all of us at Beerintheevening.com we wish you a very Merry Christmas and a Happy New Year!